High-flying barristers aren’t going to take it any more. Fed up with bullying, cantankerous and aggressive judges, barristers have drafted a code of judicial conduct to blow the whistle on bad behaviour. The judicial conduct policy – an Australian and possibly world first – was launched in Melbourne on Thursday night jointly between Victorian Bar president Matt Collins QC and Supreme Court of Victoria chief justice Anne Ferguson, after research found 59 per cent of barristers complained they had experienced inappropriate judicial conduct in the course of their career. 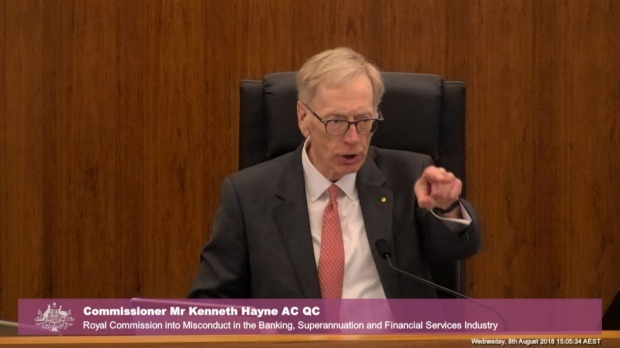 Commissioner Kenneth Hayne has taken a few barristers to task at the banking royal commission. It follows a similar survey by the NSW Bar, which found 66 per cent of their members had complained about the same issue. The focus on the welfare of lawyers comes after revelations in The Australian Financial Review that King & Wood Mallesons is the subject of an unprecedented WorkSafe investigation for overworking lawyers and staff to meet the punishing deadlines of the banking royal commission. “Very arduous”, “relentless” and “high-pressure stuff” that could burn people out of the profession, observers of the banking royal commission told the Financial Review about lawyers across the profession working 16-to-18-hour days, seven days a week to meet the commission’s tough deadlines. The judicial conduct policy – which supports barristers taking their complaints of bullying, intimidation, humiliation and denigration to the Judicial Commission without suffering detriment – is expected to shortly be rolled out across other Victorian courts. “The most common complaint is denigration by judges,” Mr Collins, who is acting for actor Rebel Wilson in her landmark defamation case, told The Financial Review. “Otherwise it includes things like abuse, shouting, even just rolling of the eyes, which if a client observes in open court can give perceptions in relation to fairness. “There is folklore about notorious judges from the past and people just accepted that was the way it was, but we are facing up to the fact that there is now an expectation for judges and barristers to meet the highest standards,” he said. “This looks like barristers beating up on judges but it is really about barristers and judges coming together in a possible world first to lift standards,” said Mr Collins, who is also acting for ANZ Banking Group in the banking royal commission. The Victorian Bar survey also found that one-third of women had experienced discrimination, mostly from outside the courts, for example, from solicitors or clients, and 37 per cent of women and 20 per cent of men said they had experienced workplace bullying. Despite the concern over bullying and almost 70 per cent experiencing stress at work, the survey also found that more than 70 per cent were satisfied with the overall quality of their working lives, and almost 80 per cent were satisfied with their jobs as a whole.